Zombies, Run! community care package – Zombies, Run! The Zombies, Run! community continues to astound us. At Six to Start, we usually see it as our jobs to deliver goodies to Zombies, Run! fans, but you guys had to go and do one better. We received a care package from a group of you, containing all manner of thoughtful, creative fan-made Zombies, Run! gifts. Look! See? Awesome miniature versions of your favourite Zombies, Run! characters made from modelling clay. And that’s just scratching the surface. The entire company gathered round to watch the box being opened. And not just because it contained a large quantity of curly wurlys! From left to right, you can see community support / QA testers Lou Atherton and Brad Porter, lead writer Naomi Alderman, developers Jeremy Stevens, Babu Madhikarmi and Mo Ramezanpoor, writer Rebecca Levene, developer Alex Primavesi, your humble community manager Jem Alexander, director Matt Wieteska, office manager Sophie Baker and producer Georgina Hulland-Brown. Our CEO, Adrian Hon, is hiding behind the camera. 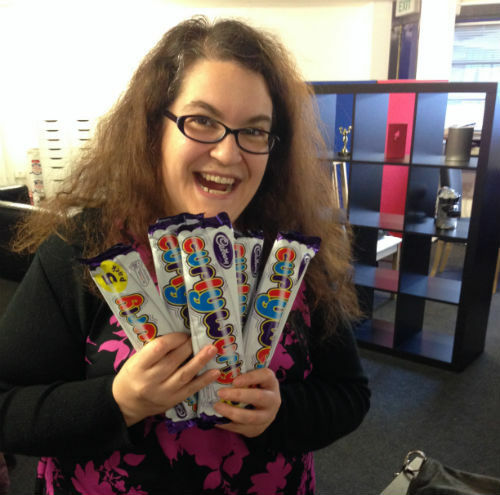 The curly wurlys went down especially well with the game’s lead writer, Naomi Alderman. 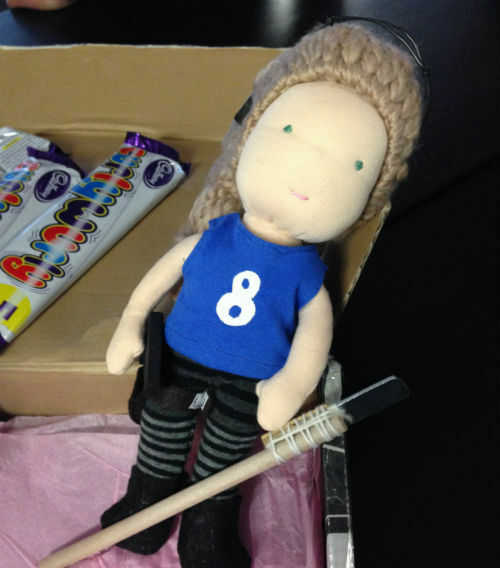 Community member Sarah McTavish (SarahRunsFromZombies), created an incredible doll of Runner 8, complete with a little meat cleaver attached to a little broomstick. She’s made from all natural materials and stuffed with wool sourced locally from the Toronto area of Canada. She’s amazingly soft and Naomi has already threatened to take her home to keep her. 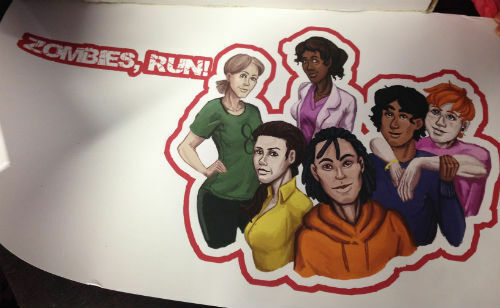 Emma St. John (Crownleys) has produced a gorgeous piece of artwork displaying Sam Yao, Janine de Luca, Runner 8, Maxine Myers and Jack & Eugene. We’re looking forward to getting this framed and putting it up somewhere special in the office! 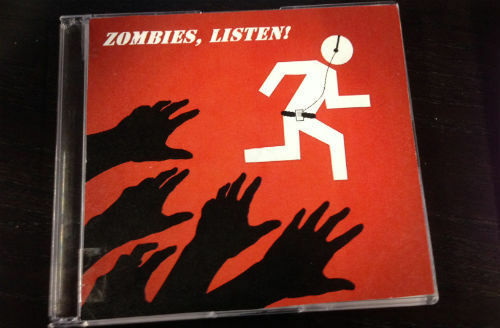 Lizz (collected-sports-bra), Emily (samyaoza-and-sportsbras) and Ana (thesassterreborn) have put together a CD of tracks produced by mixing Zombies, Run! clips with music. It’s called Zombies, Listen!, obviously. A very thoughtful gift that must’ve taken a while to put together! Finally, Ciaran Roberts (Zalia Chimera) has put together a stunning book full of messages, stories and pieces of artwork by a variety of Zombies, Run! community members. 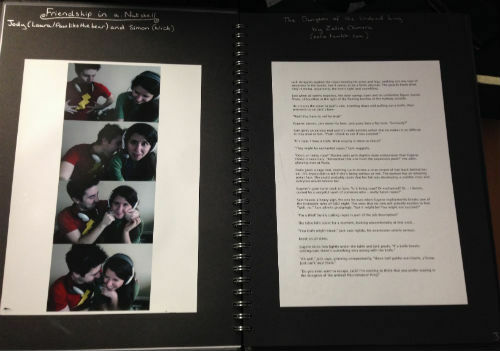 Some really touching words and sentiments are contained within. We’ll treasure it always. A huge thanks to everyone who collaborated on this incredibly kind gesture. We love it! We look forward to bringing you many more adventures and characters for you to fall in love with in the future. Next Post A few wee updates and a big thank you!